Around the World in 30 Weddings! Most of us struggle with planning just the one! 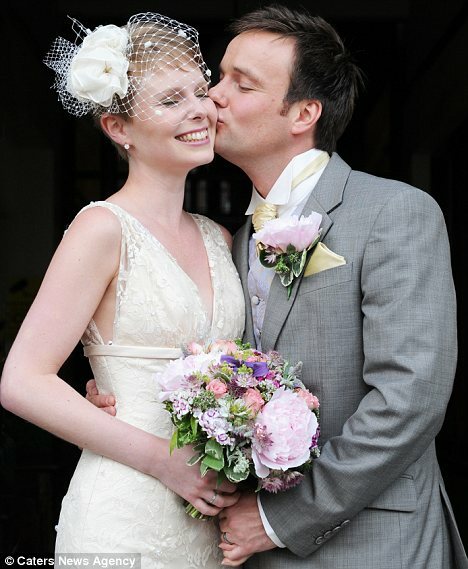 But for Alex Pelling & Lisa Grant, one wedding ceremony is all just a bit too mainstream. In a Daily Mail Online article, Manchester couple Pelling & Grant happily recount their plans to have a ceremony in EVERY COUNTRY that they visit in an epic two-year, 30-country trip. Sounds like a budget-buster to end all budgets. But, with a price-tag estimated at ﻿£50,000 (approximately $80,380 CAD), the couple really isn’t spending more than some do on just the one day. Granted, the groom did sell both his business AND his home to pay for this whirlwind escapade. But that’s neither here nor there. The couple plans to immerse themselves in the culture of each country/ceremony and say they’re even planning their own romantic version of the Mile High Club with an in-flight ceremony. Cheeky, cheeky. I do hope they’re documenting all of this. I’d totally watch it on TLC, wouldn’t you? He’s a jerk. But he’s right. There were tears. But, seriously, how can you not give props to this guy? Not only did he ask her dad for permission (a concept I know some find to be old fashioned and trite, but I like it; and, yes, LX asked my dad for permission before he proposed), he filmed, edited & had it publicly screened in order to pull off his perfect proposal. Kudos, Matt! And best of luck to you & Ginny! Who Does the I Dos? Ten years ago, our friends Heather & Graeme were married in a ceremony that I think can only be described as One of a Kind. Yeah, I know… everyone thinks their wedding is the most unique event ever to have taken place. But they’re wrong. And I’ll tell you why. You see, young Graeme is a giant Star Wars fan. He loves Star Wars. I mean LOVES. He also loves Heather. Luckily, for Graeme, she LOVES him. In fact, I’d go so far as to say she loves him even more than he loves Star Wars. In fact, she loves him so much that she agreed to his casual suggestion that he’d like to have a Star Wars-themed wedding. Seriously. She donned a dress and hairstyle that made her more than just a Princess for her wedding day – she became one specific celluloid Princess: Leia, to be exact. And her husband-to-be made himself over to be the perfect Han Solo doppelganger. The bride’s sister was Amidala (yeah, so it messes with the time line of the movie – but you actually DO wield that kind of power when it’s your wedding.) 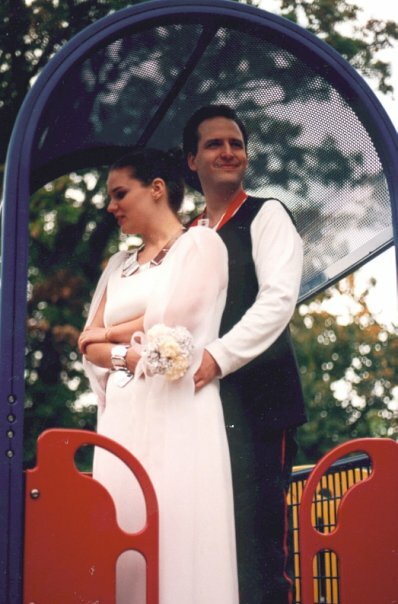 My handsome husband (appearing in my Playbill as a mere co-worker at the time) was their best man – in the role of Boba Fett (he was asked to remove the helmet, however, during the ceremony – something to do provincial legalities or some such nonsense.) I was a guest. They held the ceremony in a park and posed for wedding portraits in a multi-coloured jungle gym. Fast forward ten years (plus a few months, but who’s counting, right? Ok – Heather & Graeme probably are) and the time has rolled around for LX & I to think about who we’re going to have officiate our ceremony. We both knew we didn’t want to be married in a church or with any sort of religious service. Then we remembered Heather & Graeme’s fabulous day. And we figured that anyone who would be cool with officiating a ceremony where the entire wedding party dressed as major movie characters would be a pretty awesome choice. Unfortunately, for us, the lady who performed their ceremony had relocated to another city several hours away. However, the organization with which she was affiliated has a pretty big web presence. So a quick Google search led us to the woman would ultimately pronounce us husband & wife. The Humanist Association of Toronto has a mission statement we felt held true to our own mindset: To promote the separation of religion from public policy and foster the development of reason, compassion and critical thinking for all Canadians through secular education and community support. And a quick couple of email queries led us to Suzanne Peters – who was friendly, professional and had all kinds of information at the ready. And we wound up liking her as much in person as we did via email. She gave us the option to choose our ceremony from a myriad of options she had prepared in advance or to come up with the words we wanted spoken on our own. We chose an amalgam of the two: some of the prefab structure along with our own words & BAM – you’ve got yourself a wedding ceremony! A few sections of the ceremony are required by law and, after they were pointed out to us, we were able to write and piece together the ceremony that we wanted to have. 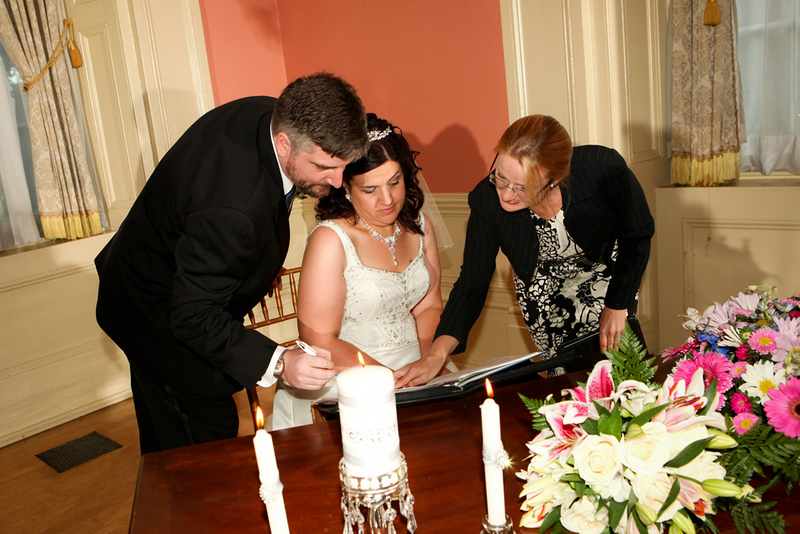 Our officiant, Suzanne, added the perfect balance of behind-the-scenes guidance and Wedding Day participation. Her warmth & humour added just the right amount of realism to a ceremony that can, if not kept in check, quickly go off the rails and into the land of saccharine.